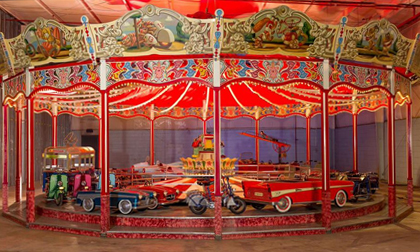 SCOTTSDALE, Ariz. – January 15, 2018 – Barrett-Jackson will take center stage this week in Scottsdale with an Automobilia docket filled with rare and exquisite pieces from around the world including Lot #9499, a full-size transportation-themed carousel manufactured by Wilhelm Hennecke of Germany in 1957. Hundreds of authentic automobilia items, ranging from vintage service station displays to pedal cars and gas pump globes, will be offered at no reserved during the 47th Annual Scottsdale Auction, January 13-21, 2018, at WestWorld of Scottsdale. Among the most anticipated automobilia pieces crossing the block is a full-size transportation-themed carousel (Lot #9499), which is the only Wilhelm Hennecke automotive-related carousel to exist in North America today. A fully functional item, which is beautifully constructed with 27 hand-built transportation-related vehicles, it is one of only five imported to the United States and Canada in the 1950s. The auction will also feature the Cedarmore Collection and James F. Scott Estate Collection, which represent more than 40 years of exceptional collecting. Mon. Jan. 15 – 9:00 a.m. – 2:30 p.m.
Tue. Jan. 16 – 9:00 a.m. – 2:00 p.m.
Wed. Jan. 17 – 8:30 a.m. – 10:00 a.m.
Thu. Jan. 18 – 8:30 a.m. – 10:00 a.m.
Fri. Jan. 19 – 8:30 a.m. – 10:00 a.m. Sat. Jan. 20 – 8:30 a.m. – 10:00 a.m.
Sun. Jan. 21 – 8:30 a.m. – 11:00 a.m.